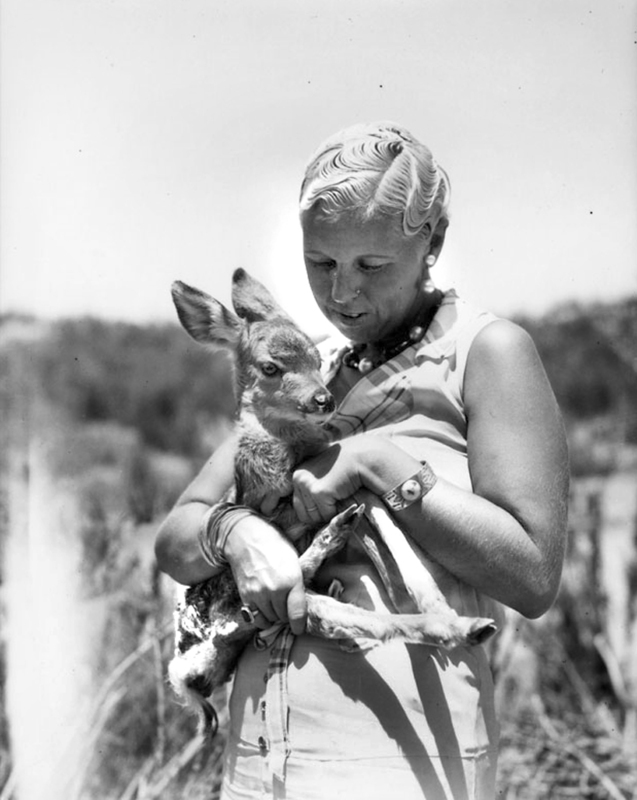 An unidentified woman holds a fawn at Remi Nadeau's deer park in Saugus (now called Canyon Country), circa 1929. The deer park opened in 1927 on the north side of Soledad Canyon Road at Whites Canyon Road. Remi Nadeau, grandson of the famous L.A. freighter of the same name, has been described as an "innovator and experimenter" — today we'd say entrepreneur — who lived a life that was "eventful and packed with adventure" (L.A. Times 1941). One of five children, he was born May 3, 1867, in Minnesota (Chrisman 2007), arrived in Los Angeles at age 1, and grew up on his grandfather's property there. A real estate developer, among other things he subdivided grandpa's L.A. ranch, which had been estimated at the time of the elder's death in 1887 to be worth in excess of $1 million. In 1908 the grandson purchased land and in what is now the heart of Canyon Country — then part of Saugus — north of Soledad Canyon Road at Whites Canyon Road (Reynolds Part 65), and made his home there. Together with his Soledad Canyon neighbor, John W. Mitchell, Nadeau purchased the former Cuneo range in upper Placerita Canyon — a couple of thousand acres in Sand Canyon and the present-day Golden Valley Ranch — where the pair raised cattle and held yearly round-ups. In 1927, Nadeau established what would become his legacy, at least locally: his "deer farm." He reportedly spent $40,000 to set it up on the Soledad Canyon property he purchased in 1908. He imported 125 mule deer from the Kaibab National Forest near the Grand Canyon; elk from Yellowstone National Park; and the stock of a zoo in Mesa, Ariz., including buffalo. It was "one of the famous sights of northern Los Angeles county" (L.A. Times 1941). It was combination wild animal park and petting zoo, but it was also its antithesis: It is said that patrons, for a fee, could shoot game on the grounds, which were enclosed by 3½ miles of fence. Today we'd call it a canned hunt. "Venison barbeques were at one time a famous specialty at the Nadeau ranch," according to the Los Angeles Times. Others have gentler memories. Neice Marilyn Nadeau Chrisman, who was 8 years old when "Uncle Rem" died at age 74 on Nov. 27, 1941, remembers that he "carefully tended his livestock, making pets out of many of the deer. It was such fun to go with him, standing close, while he called to these graceful animals and they would gingerly gather round to get some treats from his pockets." He would let his neices and nephews ride his favorite bay horse, Chappo, which outlived him by many years (Chrisman 2007). He never married. He is buried under a rough-hewn stone marker at Angelus Rosedale Cemetery, 1831 W. Washington Blvd, Los Angeles. Following his death, his siblings took ownership of his 1,800-acre ranch north of Soledad Canyon Road (Chrisman 2003). By 1946, the property was purchased by Helm and Earle Schmidt; that's when they opened the airport there, calling it the 6-S Ranch Airpark. Following Helm Schmidt's death in 1960, the airport closed and the property sold to Jerry Snider, who started development of the North Oaks subdivision at that location in 1961. There are a few things we still need to clear up about Remi Nadeau and his deer park. One is its exact location. Although Reynolds puts it directly at North Oaks, Rismanchi (Solemint's Early Neighbors, 2001) puts it a bit east of there. Also, we don't know what happened to the animals after Nadeau's death. Finally, we don't know if the name "Nadal" (Street) is mere coincidence, or something else. If you know, please contact us. It should be noted that the author Remi Allen Nadeau (aka Remi Nadeau III), born Aug. 30, 1920, is the great-great-grandson of the L.A. freighter. A student of history, Remi III earned his bachelor's degree at Stanford University and his Ph.D. at the University of California, Santa Barbara. He has written several books on subjects of Los Angeles and California history. LW2449: 9600 dpi jpeg from Security Pacific National Bank Collection at Los Angeles Public Library | Online image only.